At the end of last year we hosted a webinar where I was lucky enough to take part in an exciting discussion around our predictions for the top trends that mobile marketers need to be paying attention to this year. The session, titled “2016 Mobile Engagement Trends” and based partly on an e-book of the same name that Syniverse just published, included my colleague Rob Hammond, Syniverse’s Senior Director of Mobile Engagement, as well as special guest Paul Berney, Co-Founder and Managing Partner of the mobile educational and advisory firm mCordis. 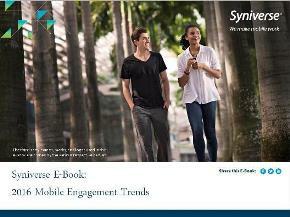 Both the e-book and webinar revealed a number of compelling insights for the year ahead. To prepare for the webinar, we spent time with a number of our customers and mobile marketing experts from companies that included BBVA Mexico, Gartner, Forrester, Intuit, MobileGroove, MasterCard and Western Union. We asked them to share their perspectives on the topic with us and shed some light on what they’re putting at the top of their mobile agendas this year. The consensus of opinion was that 2016 is finally going to be the year of mobile engagement. The rise of the mobile-first customer is transforming mobile marketing, meaning that marketing will no longer be about a one-way push of information, but a two-way exchange that engages the customer in the mobile moment. Mobile will ensure a seamless and transparent experience, redefining customer engagement and customer service. Mobile will dominate online activity and bridge the digital and physical worlds. Mobile technologies will be used to activate the buy phase and redefine commerce. Digital marketing strategies will be mobile-first, adding value to customer interactions while pushing brands to find new ways to build trust and use data. You can find out more on these predictions in our new e-book, “2016 Mobile Engagement Trends,” which you can now download here. I invite you to take a look and let us know what you think. Is your thinking for 2016 the same as our experts? Are there any other trends that you think mobile marketers should be paying particular attention to this year? Let me know in a comment. Also, don’t miss our upcoming webinar on Jan. 27, “Making Mobile Marketing Budgets Count in the Age of Ad Blocking,” which will also feature Rob Hammond and Paul Berney. We’ll examine the rise of ad-blocking tools, implications for mobile marketers, and best practices for optimizing customer engagement in conjunction with ad blocking. I hope you can join us! Jessica joined Syniverse in 2015 and brings more than nine years of mobile marketing experience to her role as Mobile Campaign Manager. In this position, Jessica focuses on devising and implementing a range of specialized solutions to enable brands and mobile service providers to better engage mobile users. Before joining Syniverse, Jessica served in a number of senior mobile and marketing positions, including Vice President of Operations for the Heartland Mobile Council for six years and Senior Product Marketing Manager of Mobile for HelloWorld for three years, and she earlier held mobile marketing leadership positions for companies including Critical Mass, Walgreens, GEM Strategy, and Vibes Media. She holds a bachelor’s degree in art from the University of Iowa.